What is the current projection in 2012? It’s the same as last year — Medicare will be solvent until 2024. That’s 12 years, or just a little below the solvency projection average of the previous two decades. And did you notice the shrinking projection trend from 2002 to 2009 that reversed, at least temporarily, in 2010? That is a result of the Medicare cost savings in the Affordable Care Act which helped to extend Medicare’s solvency projections. It’s about now that I’m sure you are asking: Why is the mainstream media talking about Medicare with such dire language? Good question! I think I know the answer. — The media best operates in crisis mode. Explaining facts like Medicare’s average solvency projection does not make for good ratings, although it can make for intelligent television. 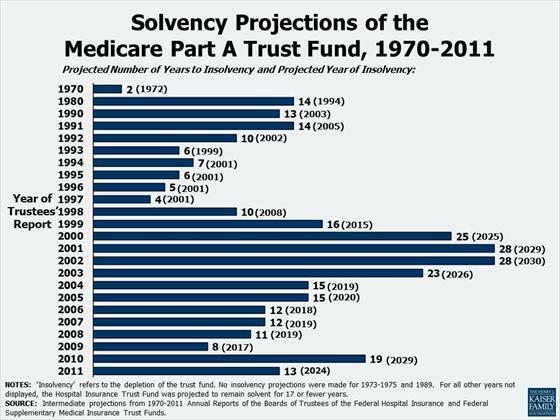 That’s why I give credit to Chris Hayes for alerting us to this Medicare solvency tidbit on both his show “Up” last weekend and when he filled in for Rachel Maddow earlier this week.